When I boarded the bus for Macworld CreativePro at the newly added White Marsh Mall stop, Jim Ritz asked how many of us were Macworld virgins. I raised my hand, along with a few others. This may have turned out to be an advantage for us. Not having previous years with which to compare to this year's newly redesigned Macworld probably spared us the disappointment that some of the others, who had been to the grander Macworlds of years past, experienced. I thoroughly enjoyed myself. The bus ride itself was pleasant. The sun was shining, traffic wasn't too horrific, and the company was fascinating. Isolated as I sometimes am while teaching classes in PC labs at the Government Printing Office, or in the Mac lab at Trinity College, I was delighted to see the sheer number of computer professionals who use the Mac. After making a quick stop to pick up portable breakfast foods, then watching a charming little movie called Shanghai Knights, we arrived at the Javits Center exactly on schedule. At 10:00, the doors opened, and we streamed into the exhibition hall. There was a dazzling array (though smaller by half, I was told) of products at booths ranging from Epson to O'Reilly books. A free copy of the O'Reilly Pocket Guide, Macintosh Troubleshooting, was available from the Tekserve booth. Within the first half hour, I discovered what was to become my favorite place at Macworld: the User Group Lounge. Upon entering the lounge, the first thing I noticed was a table with samples of journals and newsletters from the various Mac User Groups. There, in two proud stacks, was the unique and royal Washington Apple Pi Journal. I say royal because nothing remotely came close to it in either magnitude or quality. Almost everything else was a 4-page newsletter or brochure-type publication. I heard many people fuss and exclaim over the Pi Journal, and the stacks were almost completely flat by the time we left. 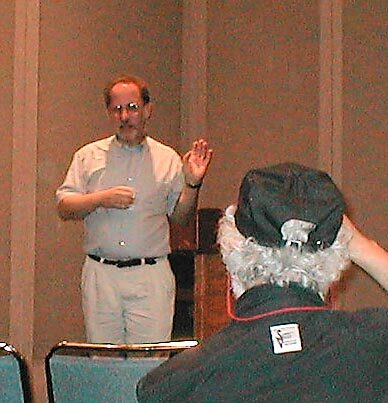 The User Group Lounge featured many guest speakers who are "stars" in the Macintosh world. 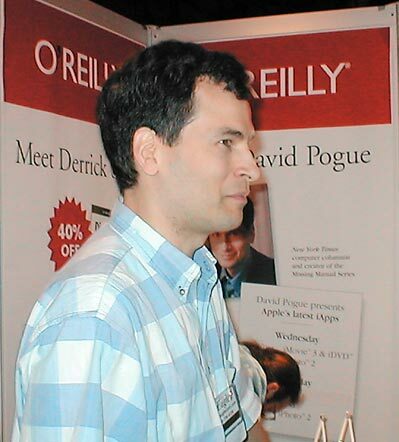 The first one I got to hear was David Pogue, creator of the Missing Manual series. Many of you probably have his Mac OS X Missing Manual or his iPhoto Missing Manual. This day, he was promoting his iPhoto 2 and iPod Missing Manual books. He gave us quite a few interesting tips while entertaining us in almost stand-up comic style. One piece of information that surprised me was a tidbit about the mini DV tapes we use with our camcorders. Most of us bring the footage into our computers, create movies with iMovie or some other software, and then archive high quality movies to DVD or CD media. We then tape new footage over the old on our DV tapes. Mr. Pogue advised us not to do this if we value what is on the tapes. The highest quality, least compressed footage remains on those tapes. Though tapes last only about 15 years and then begin to degrade, you can always save the footage to a new tape after a while. The other thing he warned us about was to get the latest upgrades of QuickTime 6.3 and iMovie 3.03.. There were problems with the Ken Burns effect in iMovie 3, as well as other bugs, in earlier versions of of QuickTime 6 and iMovie 3. The second speakers we saw were Dennis Sellers and Jim Dalrymple of MacCentral. There was a lengthy discussion about the "downsizing" of Macworld and the possibility of next year's event taking place in Boston. Jim Dalrymple said that he wouldn't be the least bit surprised to see a Macworld Creative Pro in New York again. He assured us that this year's event was considered a success in spite of its smaller scale, and vendors seemed happy. The last speaker of the day was Ted Landau who wrote Sad Macs, Bombs, and other Disasters and Mac OS X Disaster Relief. He spoke of the problem of trying to write a book of this nature. While the book is in progress, bug releases, dot upgrades, and even new versions of the operating system are released. Additionally, Apple distanced themselves from these books because of the word "disaster" in the title. Other highlights of the day included wandering with Joe Maris over to B & H Photo. Buses were running every 10 minutes to and from the store. Many other WAP members were there buying equipment. At one point, Phil Marchetti, who was also there, sent his E-mail address via infrared to my Palm Pilot VII as we stood in the middle of an aisle. Probably one of the most memorable events of the day was one I initially wanted to forget. I was standing at the O'Reilly booth with WAP member Martha Johnson, who wanted to buy the Dreamweaver MX Missing Manual book. She asked me what I thought of it, and I shrugged and said that I wouldn't buy it, as I probably pretty much knew everything in it. Before you accuse me of unfounded arrogance, be aware that I have been teaching Dreamweaver since version 2 at the Government Printing Office, I also teach it at Trinity College, am a Macromedia Certified Dreamweaver Developer, and I have a shelf full of Dreamweaver books that I received from the GPO book contact. The last thing I need is another general Dreamweaver book. As luck would have it, however, as I made my disparaging remark, a gentleman next to me let out a "whoosh" sound. I turned to look at him, and he immediately said, "I am the author, Dave McFarland." I stuttered and turned red, and tried to explain myself. Fortunately, Dave was not offended. He even signed the book for Martha after she bought it, and stood and talked to us awhile. There is a sequel to this story. I did end up looking the book over at my local Borders, and decided it would be perfect for my students at Trinity. The chair of the department wrote me the day after we got back from Macworld, and asked what book I would be using for the Web Page Design class. I submitted my order for David McFarland's book! I wrote him at his Web site to tell him so, and to thank him for being so polite in spite of my faux pas. I got a very nice reply back. By the time 6:00 came around, most of us were pretty exhausted and ready to hop back on that bus. At around 7:45 we stopped at Mastori's restaurant in New Jersey and had a great meal. By 9:45 we were back on the bus, and by 11:30 we were back at White Marsh Mall. I only hope that Dennis and Jim of MacCentral are right, and that there will be another New York event next summer. I definitely plan to go!